Once again Division 4 will be holding an auction at the MARCH meeting. If you’re like most of us you have accumulated an abundance of items you do not really need anymore or will never get time to use. 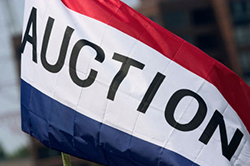 The auction is a perfect place to sell those valuable items to someone that has a use for them and will appreciate them. Gather them up and get ready to sell them off so you can purchase that special engine, car, or building you really want. You will clear out some shelf room and have some funds in your railroad fund. The Division with NOT COLLECT ANY SALES FEES AGAIN THIS YEAR! To save you time Auction Forms are provided on the Division website and at the FEBRUARY meeting so that you can fill them out before the meeting. Please print out and enter the following information for each item or lot that you will have for sale. It will save a lot of time if you have Auction Forms filled out BEFORE the auction starts. BIDDERS: Bids start at $5.00. Fill out your ‘Starting Bid’ and ‘Description’ boxes only! DO NOT FILL IN ANYTHING IN THE SELLER NUMBER AND BUYER NUMBER BOXES. You will be given a numbered paddle at the auction. Those paddle numbers will be used in both the Seller Number and Buyer Number on the night of the auction. The Bid Price, Sale Price and Buyer Number will be filled in at the time of the sale. Payment for all items sold will be collected from buyers prior to payments being made to sellers. It is okay to use the forms dated 2017.